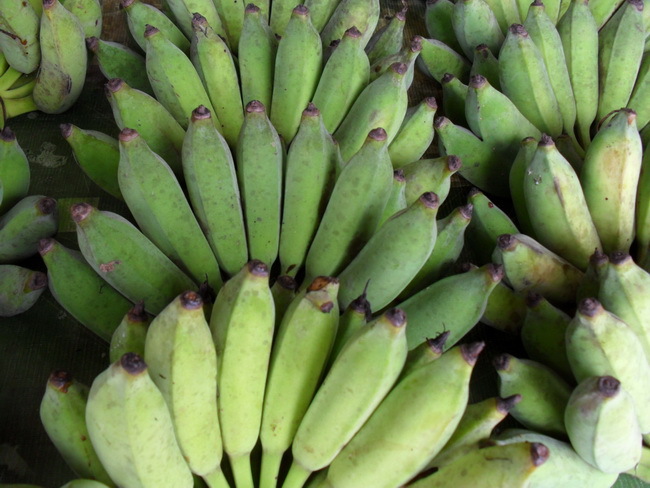 Ripe fragrant bananas are a popular all-day snack. It goes well with breakfast cereals and is ideal for making banana fritters, cakes and ice-cream. 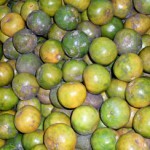 Has a thinner golden-yellow skin when ripe. 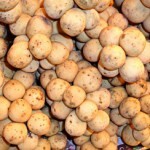 It is eaten fresh or cooked in a light syrup. 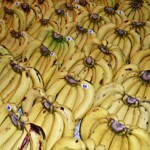 It is also popular as dried banana, candy, or cake. 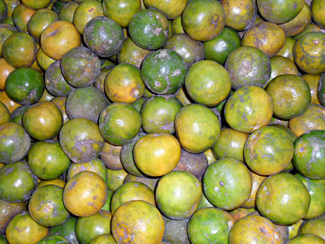 Sticky and sweet when ripe, Kluai Nam Wa is valued for its high nutritional value. It is often used in a dessert known as Kluai Buat Chee in which slices of banana are cooked in coconut milk. It is also a key ingredient of steamed desserts made with glutinous rice, or rice flour, such as in Khao Tom Mut or Khanom Kluai. 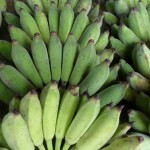 A cooking banana that is delicious when roasted or grilled. 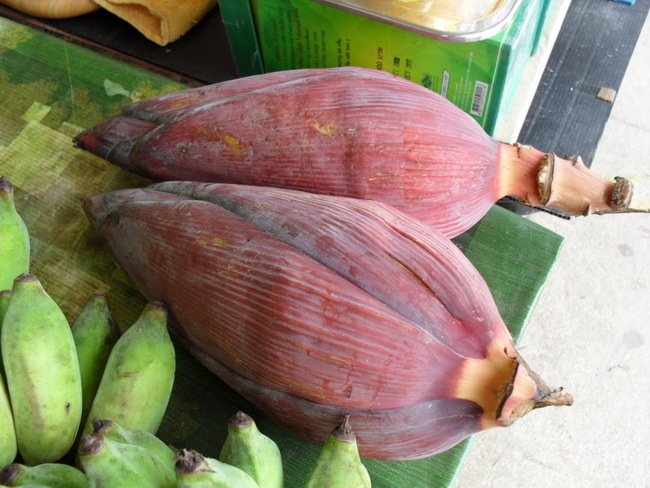 Banana blossoms known as “Hua Plee” are used fresh as a garnish for the famous Pad Thai noodle dish, used in Thai salads or yam, or eaten raw as a salad vegetable served with chilli dips called nam prik. 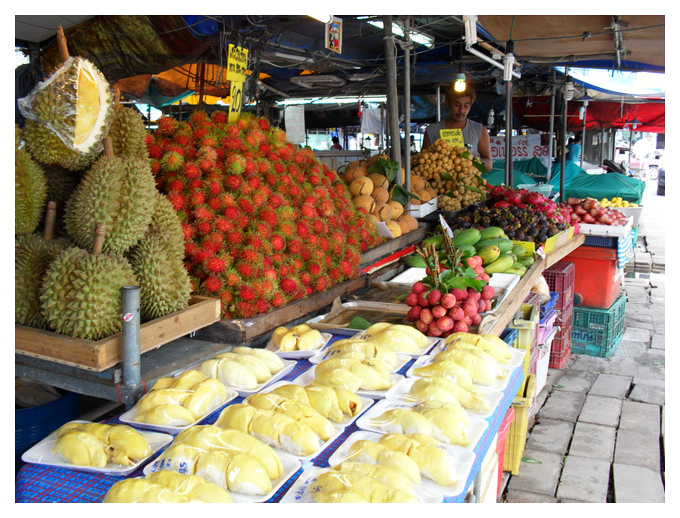 Considered to be the ‘King of Thai Fruits’, Thais prefer a durian that is just ripe. The flesh should be slightly soft to the touch but without being crunchy. Durian is without a doubt, an acquired taste. For the first taste of durian, Mon Tong or the Golden Pillow Durian with its light creamy texture is the mildest of the durians and is widely available throughout Thailand. Alternatively some of the other milder options include Durian ice-cream or Khao Nieow Turian – Sticky Rice topped with durian meat cooked in a coconut cream sauce, and Turian Kuan, a preserved durian toffee, or jams. 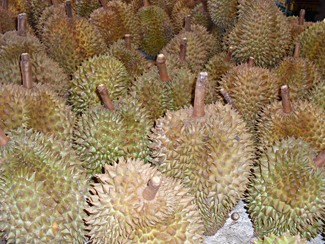 Kahn Yaow or the Long-Stem Durian with firmer yellow flesh and Chanee or Gibbon Durian with its golden yellow flesh have a richer and more distinctive flavour and is much sought after by true durian connoisseurs, although in the city, it is becoming an increasingly rare commodity. 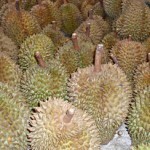 The best durian is judged by the thickness of the flesh and the size of its seed. (The smaller the seed relative to the amount of flesh, the better.) Durian ripens quickly in the hot tropical climate. As the fruit ripens, the flesh takes on a creamy consistency and the intensity of the aroma increases. (Given this lingering and at times overwhelming aroma, durian is banned from hotel rooms, cinemas, aircraft, limousines, coaches and vans.) 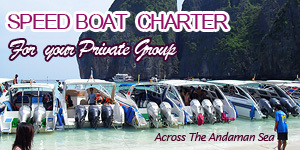 The best durian are from the orchards of the Eastern provinces of Thailand namely Rayong, Trat, Prachin Buri, Chanthaburi and Surat and Chumphon in southern Thailand. 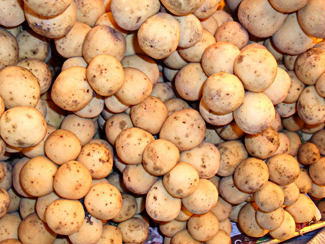 Of the same family as the langsat, the rounder longkong has thicker skin with less sap making it easier to peel. It is more fragrant and noticeably sweeter. With longkong being the connoisseur’s choice, it is slightly more expensive. 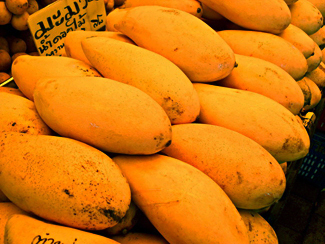 All Thai mangoes are sweet, juicy, and fragrant, when ripe. 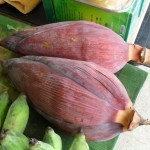 However the “Nam Dawk Mai” and “Ok Long” variety are best known. They are the favourite choices as dessert fruit or as “Mango and Sticky (glutinous) Rice”, a popular dessert during the peak of the mango season in the summer. “Ma-muang Keow Savoey” and “Ma-muang Rat” are also delicious as ripe mango but Thais prefer to enjoy both of these as raw mango served with a dry salt-and-sugar dip seasoned with crushed chilli called prik kab kleua or a savoury chilli dip prepared by blending palm sugar with fish sauce heated to a caramel-like consistency called nam pla wan. Green Keow Savoey is sweet and has a powdery texture, while Ma-muang Rat is predominantly sour with a hint of sweet. Raw mangoes add a more delicate sour flavour to dishes and are featured in Thai salads such as Yam Ma-muang and in chilli dips. 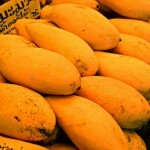 Thai mangoes come in many other preserved forms such as delicious mango ice-cream, or pickled mango – Ma-muang Dong, Ma-muang Chae-Im or dried mango, and Ma-muang Kuan. Mangos are a major fruit crop in Sakhon Nakhon province in Northern Thailand, Yasothon, Si Sa Ket and Chaiyaphum in Northeastern Thailand, Ratchaburi and Chon Buri in Central Thailand, and Prachin Buri in Eastern Thailand. Fresh Thai tangerines have a highly aromatic thin greenish-yellow peel and are refreshingly sweet when ripe, perfect when served as fresh fruit or as a juice or cocktail mixer. To make the most of its delicate refreshing taste, oranges are served in a very light syrup on crushed ice. 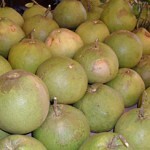 Native to Thailand and Southeast Asia, pomelo is the Asian equivalent of grapefruit, but significantly larger in size. The green peel is aromatic. The sweet and juicy champagne pink flesh of Som O Thong Dee or Brilliant Gold Pomelo and the virtually translucent and crisper flesh of Som O Khao Hom or Fragrant Rice Pomelo are considered to be the best of Thai pomelo. Because of its light tangy flavour, Som O Khao Hom adds a delicate harmonious flavour to Thai salads or yam. 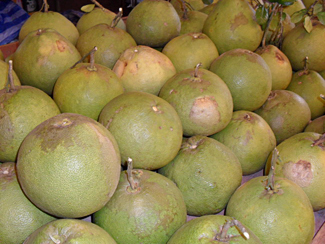 Pomelo is grown in the orchards of the lower North and Central region, particularly in Nakhon Pathom province, and in the provinces of Surat Thani and Trang in Southern Thailand. 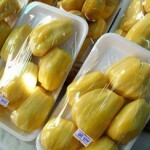 Jackfruit becomes sweeter as it ripens. When served chilled, the chewy flesh has a crunchier texture to it. Given its natural sweetness and fragrance, jackfruit is often used as a topping to enhance a wide range of Thai desserts such as a rich traditional home-made coconut ice-cream, Ruam Mitr – a light dessert with young coconut meat, an assortment of cooked strips of rice flour, syrup and a dash of coconut milk topped with shaved ice, or Jackfruit served with Sticky Rice, plain and simple. Deep-fried jackfruit is also a popular snack and dessert. Jackfruit ice-cream is gaining popularity. A versatile fruit, every part of the jackfruit is edible and leaves, flowers and seeds are featured in savoury dishes such as curries or served with nam prik chilli dips. 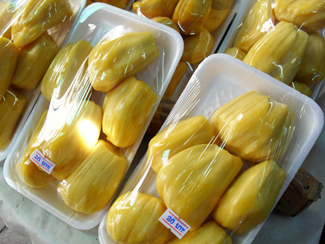 The provinces of Chonburi, Uttaradit, Nakhon Ratchasima are famous for their jackfruit. Prime grade fresh lychees are large in size with a thicker bright red skin. 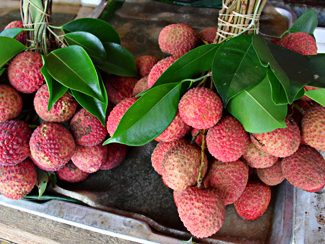 Lychees with thick, succulent flesh surrounding a relatively small seed, such as in the “Hong Huai” and “Chakrapat” (Emperor lychees), are considered to be the best quality. These are predominantly sweet. 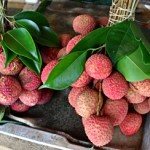 However for those who prefer flavourful lychees with a sharper taste, look out for oval-shaped lychees with brittle skin. These are sweet and slightly sour. 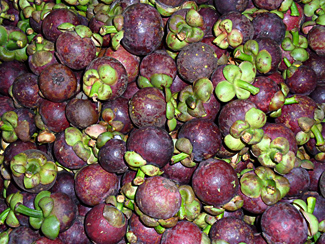 There is tremendous worldwide demand for this exotic dessert fruit and Thai lychees are one of Thailand’s leading economic crops ranking high on the list of top exports shipped to all corners of the globe in a variety of forms – fresh, dried, frozen, and canned, as well as lychee juice or wine. 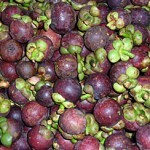 Lychees are primarily grown in the Central Plains and in Northern Thailand. Considered to be the “Queen of Tropical Fruits”, there are five or six small segments of white flesh contained within the hard, dark reddish purple outer shell. When ripe, the outer shell yields to slight pressure and cracks easily to reveal the soft, white flesh with a refreshing sweet and tangy taste. To avoid crushing the delicate flesh within, it is best to make a continuous clean cut around the circumference by turning the mangosteen clockwise or counter-clockwise through the dark beetroot-coloured pith but without cutting through the flesh. 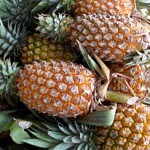 There are two distinct varieties of pineapple grown in Thailand. An extremely sweet and succulent pineapple with softer lemon-yellow pulp called the Siracha pineapple and a crunchy pineapple with a delicate sweet taste. A pinch of salt is often rubbed into freshly cut pineapple to offset its bite. 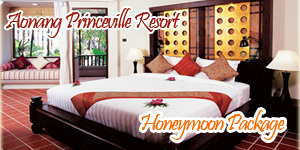 The Siracha and Phuket pineapples flourish in the South in the provinces of Surat Thani and Hua Hin. A new variety of miniature Phuket pineapples are now grown at The Royal Project experimental agricultural stations in northern Thailand. Thailand is one of Southeast Asia’s largest producer and exporter of pineapples in the form of canned pineapple and juice. Excess pineapple is also sun-dried, and processed into jams, chewy toffee and candy. 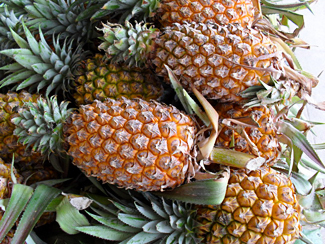 As fragrant pineapple adds natural sweetness and contributes to the harmony of flavours that is the distinctive quality of Thai cuisine, it is commonly used as a flavouring or garnish in savoury dishes, for example, pineapple curries such as Kaeng Sapparote, Saow Nam or Khao Ob Sapparote – Rice Baked in Pineapple. 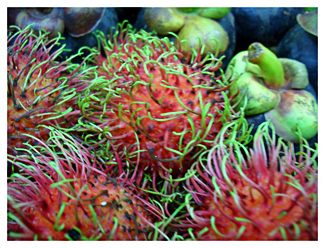 In Thailand, there are two varieties of rambutan, a fruit with a thick and hairy outer skin. “Ngoh Rong Rian” has sweet, succulent flesh that clings to the seed, while the oval-shaped Si Chompoo, the “pink” rambutan, has crisp, white flesh that comes off the seed easily. 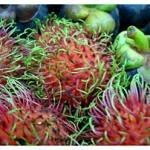 Rambutan orchards are commonly found in Chanthaburi and the provinces of the South. Scooped into balls for garnishing or served as a refreshing snack, fruit juice, sorbet, or salads, Thai water melons are said to be the best in the world in terms of its flavour and texture. The variety with dark, green skin has rich red flesh that is sweet and juicy, and crisp when well-chilled. Its texture is slightly gritty. 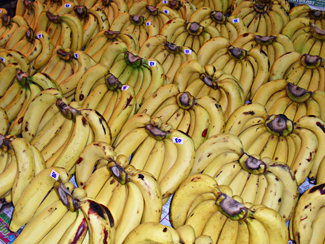 The variety with light green skin and alternating dark stripes has sweet, juicy yellow flesh. 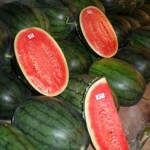 Given the thickness of its skin, water melons are frequently featured in fruit-carving. Little goes to waste, Kaeng Som Taeng Mo Lek, a light sweet-and-sour hot soup prepared with young melon and served with a side dish of deep-fried dried freshwater fish pounded into a coarse, crunchy powder, offers a tasty alternative to the thicker coconut curries. Dried melon kernels are also a popular snack and appetizer. 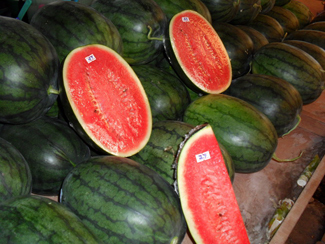 Water melons are grown in the provinces of Roi Et, Yasothon, Ratchaburi and Samut Sakhon. 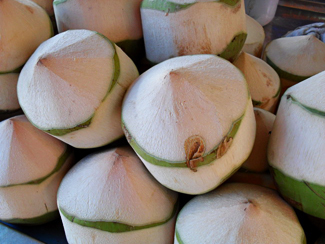 Available all year round, the cool light refreshing juice of fresh young coconuts is a popular “Welcome Drink” and mixer for exotic tropical cocktails. The tender, white flesh is edible and can be easily scooped out with a spoon. It is often featured as a key ingredient in light desserts served with crushed or shaved ice and topped with coconut milk. 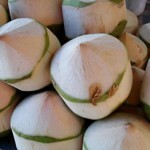 As the coconut matures, the kernel becomes solid and the flesh is grated to make coconut cream, an integral ingredient in Thai cuisine used as a base for curries and desserts such as Sankhaya – Coconut Custard, Khanom Kroke – Coconut Pancakes and Kluai Buat Chee – banana slices cooked in coconut milk.